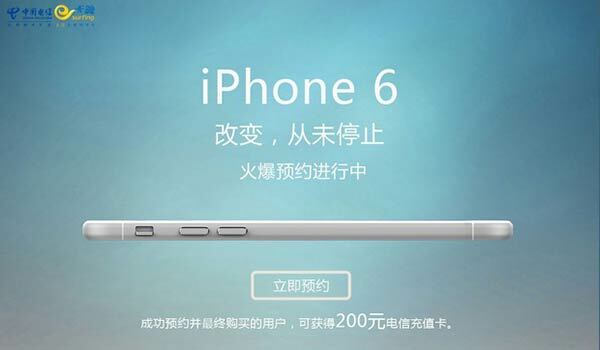 As reported by tech stalwarts ZDNet China Telecom’s pre-launch ad went into great detail about the upcoming iPhone 6. The pictures and layout are very Apple-esque and even highlighted key points about the smartphone’s design. Please take a look below. If you are wondering what the Chinese subheading text says beneath the ‘iPhone 6’ heading it is roughly “You are even more powerful than you could imagine”. The picture, which also reveals the three launch colours, details the improved Touch ID button, a powerful new SoC called the A8, better selfies facilitated by the 3MP front camera and improved battery life. Furthermore ZDNet reports that clicking through to actually make a pre-order allows customers to select between the 4.7-inch and 5.5-inch screen iPhone 6 model. Both models of the iPhone 6 will be made available with a choice of 16, 32 or 64GB of storage. 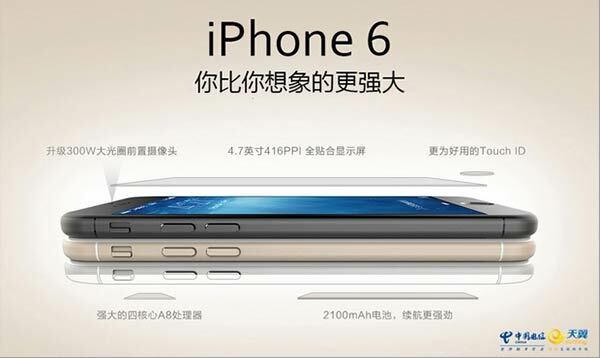 The smaller model might be known as the iPhone 6 Air and the larger model the iPhone 6 Pro. 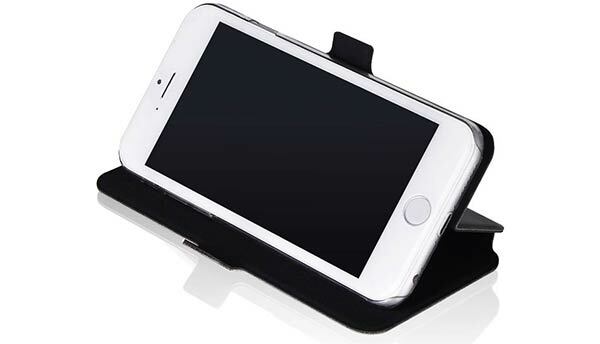 From outside of China, nearby Taiwan, I received an email on Friday from LUXA2, part of the Thermaltake group, telling me all about the iPhone 6 accessories it has made ready including various cases, stands and charging accessories. No NDA was in the email but I can’t see these products on the company website at the time of writing. The NYT has reported a number of aspects of the new iPhone designs. One particular interesting new tweak to iOS will aid in one-handed use of the smartphone. This setting will be toggle-able in the system settings. The NYT also reports that the new designs will be much more rounded than the recent sharp edged predecessors. Tech Assimilate has previously reported on another big new feature that is expected – easy NFC payments using your smartphone thanks to partnerships with various credit card companies. More rumours suggest a sapphire glass screen and improved security. So we are all looking forward to the event. You can watch it live on Apple’s event countdown site – as long as you have Safari 5.1.10 or later on OS X v10.6.8 or later; Safari on iOS 6.0 or later. Streaming via Apple TV requires second- or third-generation Apple TV with software 6.2 or later. In other news – people are already queuing at Apple Stores to be among the first to secure a new iDevice. 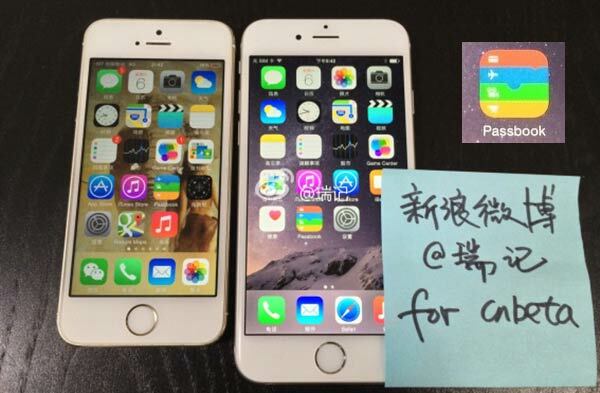 A working iPhone 6 has been pictured with the new NFC payment supporting Passbook app running. This is one of the first pictures showing an iPhone 6 running and activated, not just a dummy or component. 9to5Mac found the pictures on a Chinese forum. Picture embedded below, highlighting Passbook.